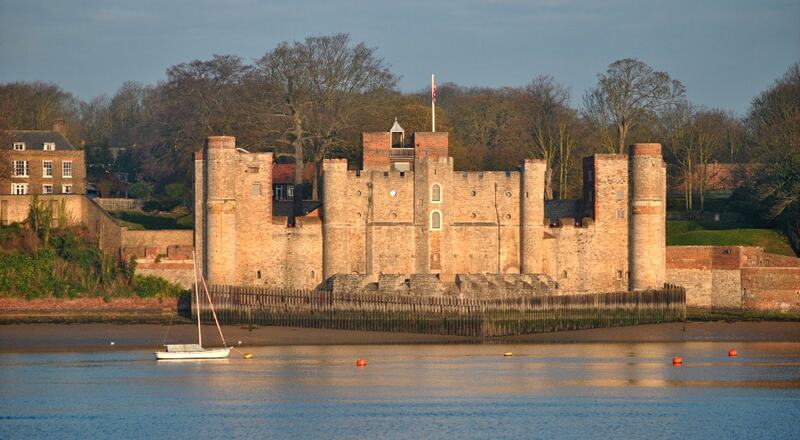 Upnor Castle is an Elizabethan artillery fort located on the west bank of the River Medway in Kent. It is in the village of Upnor, opposite and a short distance downriver from the Chatham Dockyard, at one time a key naval facility. The fort was intended to protect both the dockyard and ships of the Royal Navy anchored in the Medway. It was constructed between 1559-67 on the orders of Elizabeth I, during a period of tension with Spain and other European powers. It was garrisoned by about 80 men with a peak armament of around 20 cannon of various calibres. It remained in military use until as late as 1945. The castle was subsequently opened to the public and is now an English Heritage property.